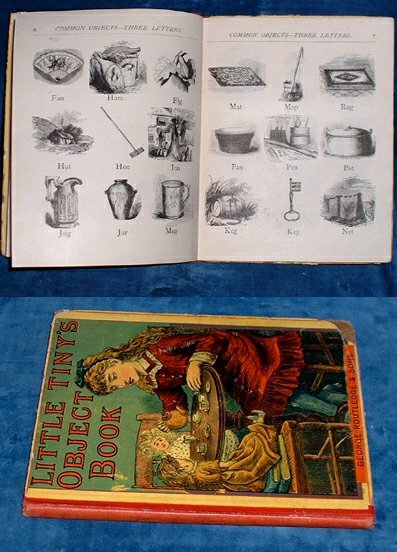 Title: LITTLE TINY'S BOOK OF OBJECTS with more than Seven Hundred Illustrations. Description: London, George Routledge and Sons (part of the “Master Jack” series). 1881] from inscrition & British Library Full page illustrations by M.E.E. ie M.E. Edwards, M. Kern, H.(arrison) Weir, E.F. Manning et al. + composite plates. . Square octavo red cloth spined boards with picture of girl giving a tea party for her dolls +lower boards with catalogue of Routledge Gift & Children's Books (tips worn/small corner of paper missing to each cover) 95pp. Subjects grouped by 3,4 letter words, or by subject -eg. kitchen objects, on the road, on the railway, scientific objects such as sextant, microscope, air pump etc. Neat inscription on fly leaf Edith L.A. Emerson Tennent from Aunt Rosa Jan 1st 1881. Very neat clean tight copy.